The National Law Enforcement Officers Memorial Fund has issued a new report with preliminary data through June 30, 2017, revealing that 65 law enforcement officers have been killed in the line of duty in 2017—a 30% increase over the same period last year (50). Of these 65 officers, 26 were killed in traffic-related incidents, 23 were killed by gunfire, and 16 died due to other causes such as job-related illnesses. • Traffic-related fatalities were the leading cause of law enforcement deaths for the first half of this year, with 26 fatalities in 2017, compared to 21 over the same period in 2016—an increase of 24%. Notably, 10 of the incidents were single-vehicle crashes, where an officer crashed without making impact with another vehicle. This represents an alarming 233% increase from the first half of last year. • Firearms-related fatalities rose slightly from the 21 during the same period in 2016. Domestic-related incidents continue to be the leading cause of officers being shot and killed in the line of duty, with five in the first half of this year so far. 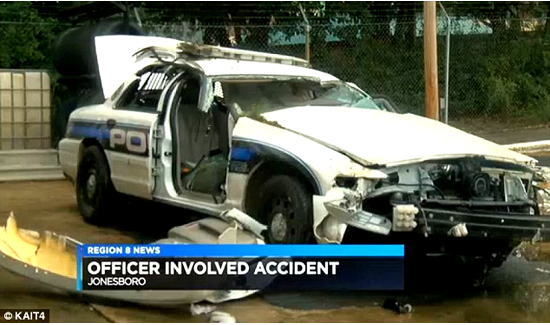 Three officers were killed in ambush-style attacks as of June 30. Of the 23 firearm-related fatalities, six were shot and killed in May, the most of any other month. • Sixteen officers died of other causes as of June 30 that include job-related illnesses, drownings and illnesses related to rescue and recovery efforts after 9/11. • Georgia and New York lead the country in officer fatalities with five officers lost in the line of duty for the first half of 2017. California, Florida and Texas each have had four officers killed, while three were killed in Louisiana as of June 30. • The National Law Enforcement Museum at the Motorola Solutions Foundation Building, a project of the Memorial Fund, is currently under construction in Washington, DC. The Museum will help strengthen the bond shared by law enforcement and the communities they serve. The Museum currently hosts free programming and workshops designed to educate the public about law enforcement policies and tactics. When the Museum opens in the fall of 2018, it will tackle tough issues our country faces with open dialog amongst law enforcement, civic leaders and citizens of this country. A copy of the full report, “2017 Mid-Year Law Enforcement Officer Fatalities Report,” is available at www.LawMemorial.org/FatalitiesReport.